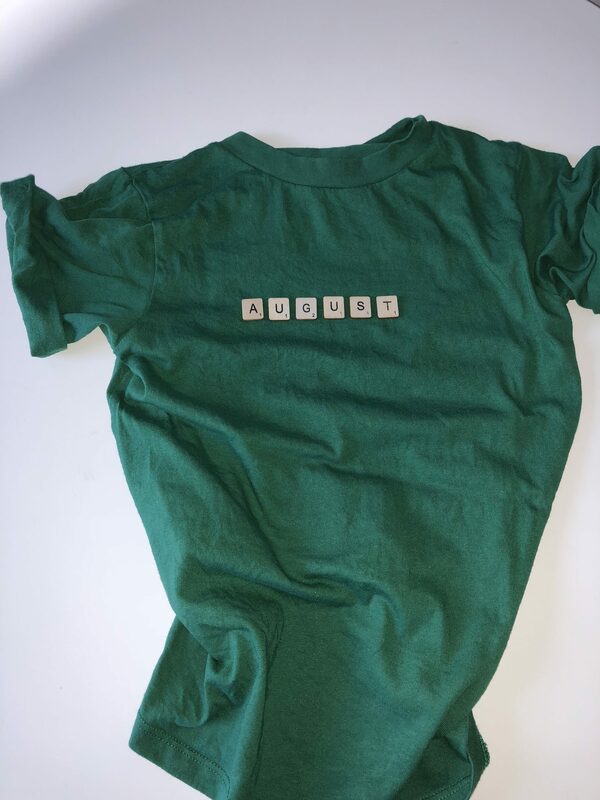 How is it September already? Really how has this year gone so fast, and even more so I was sick for the first 6 months of it. Its going crazy fast and before you know it, it will be Christmas! So I have found a variety again that I have loved in August to share with you because why not a favourite can be completely anything, from a book to a person or place. Absolutely anything. 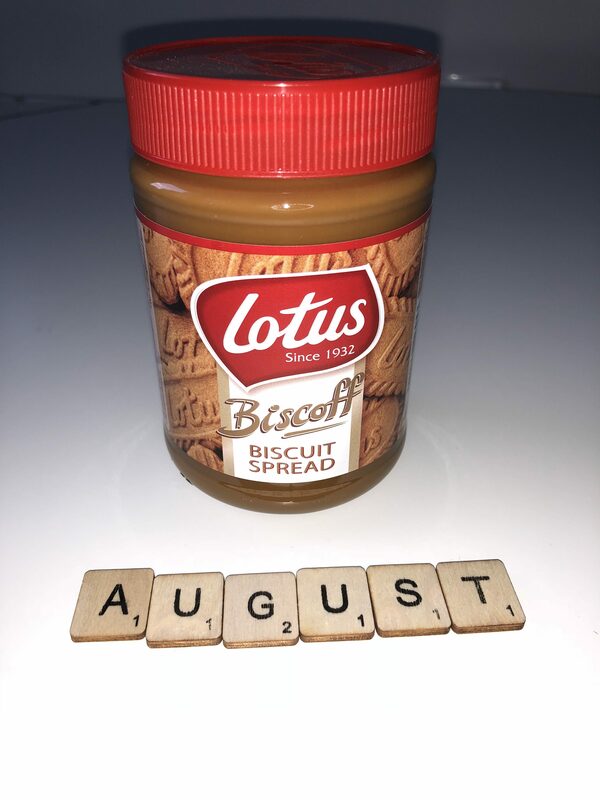 So my first favourite I am going to talk about is Lotus Biscoff Spread. If you haven’t tried this you have to. But if you have no willpower to have one slice of toast then I would have to tell you this product isn’t for you. I discovered this 2 weeks ago, I only brought it purely because I didn’t have much money and it was cheaper than Nutella but my god its worth the money. I like to eat pretty healthy and clean, with Friday and the weekend being “cheat” days. Well I couldn’t stop myself with this. Its so yummy. Every morning I’ve had this in a brown bread toasted sandwich with raspberries and blueberries on the side. Its so good. The reason I say if you don’t have willpower don’t eat this is because I seem to have lack of it at the moment and when I am cooking dinner the jar seems to jump into my hand with a spoon. Pinterest have some lovely sounding recipes for this too. I found this in Asda but I am sure most supermarkets will stock this. Secondly for food I am loving Marks and Spencer’s Sweet Chilli and Mango Dipping Sauce. I have always been a fan of sweet chilli sauce but the mango in this adds a little extra sweetness and kick to the sauce. Its so good with stir fry or fish but I could eat this with most dishes. I have really got back into crafts recently and learning new crafts to add to the collection I can already do. Anything I see creative I am like yes I want to do this. Thats a good idea etc. I stopped doing crafts on my youtube channel awhile ago to concentrate more on fashion and lifestyle but the love I have for crafts is back and I am making stuff that ties in with fashion, beauty, lifestyle and travel. With lots more ideas to come on here and on my youtube. When I went to Potters on holiday back in July I learnt to make jewellery. Its something I had already visited and liked before but never really got into. Well I now love it. I love making any sort of jewellery and trying out new ideas. I also love chokers so that was something I had to make straight away. I have also now decided I will try to sell some on Etsy and see what happens. I love to sell and create for other people. With crafts in mind Pinterest has been entertaining me when I am bored. 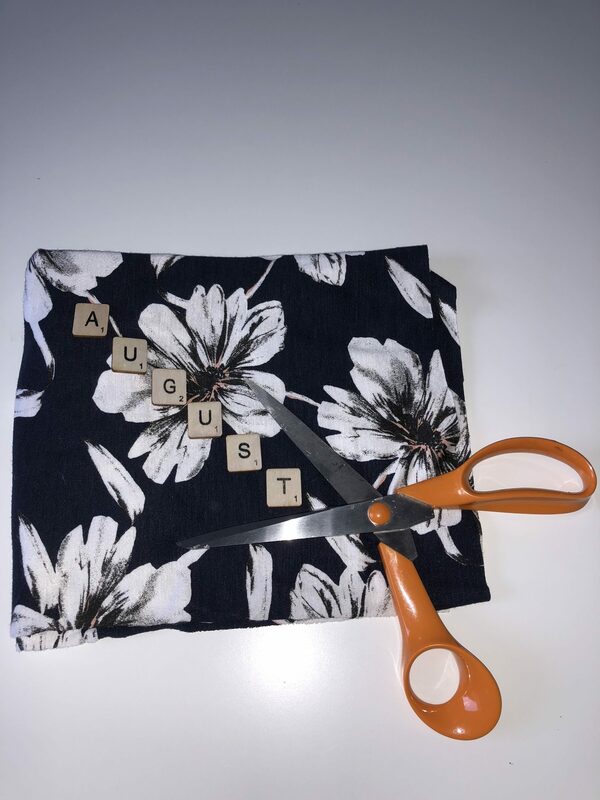 I love to find ideas for videos, blog, instragram posts and crafts to do. I can sit on it for hours and pin so much. I love to watch dramas and documentaries on the olden times such as call the midwife, ok this is completely different to call the midwife but its from the olden times and actually seeing as I am 28 and its what I would call a youtube channel for children, I would say go watch it. A Girl Named Jo on youtube channel Brat is really good. I watched the first episode as it was from the olden times and a story line of friends finding out about how Jo’s mum died. I was hooked. Its really well put together and filmed. I have also been loving BBC 1 Casualty. I have loved the Alyssia storyline where she was raped by the junior doctor, then being to frightened to tell and it all leading to an accident. I don’t want to tell you too much to ruin it. I have watched Casualty since I was 7 and go in and out of watching religiously or not. Well this storyline over the last month or so has been really good and If I was out I would watch this on iplayer to catch up. 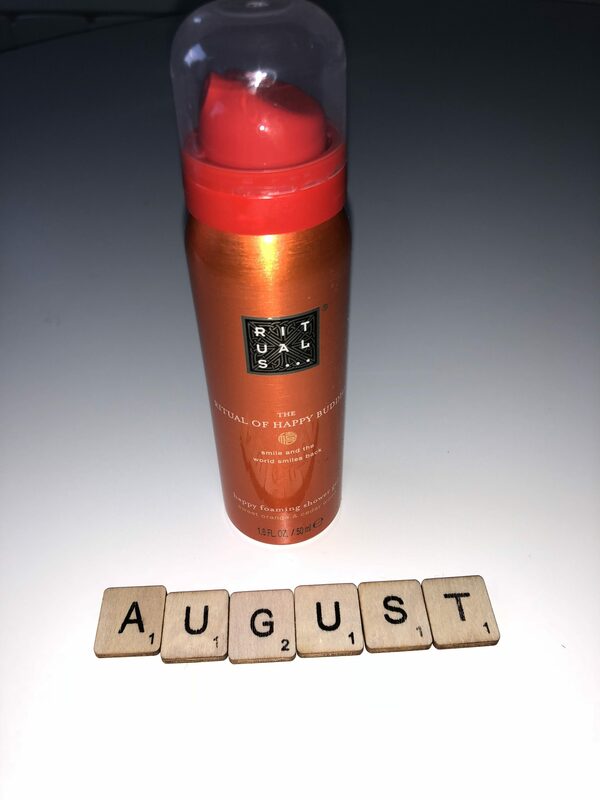 I have been disappointed over the last few months especially with my Birchbox beauty subscription however this month I have found 2 products I will definitely be buying again. 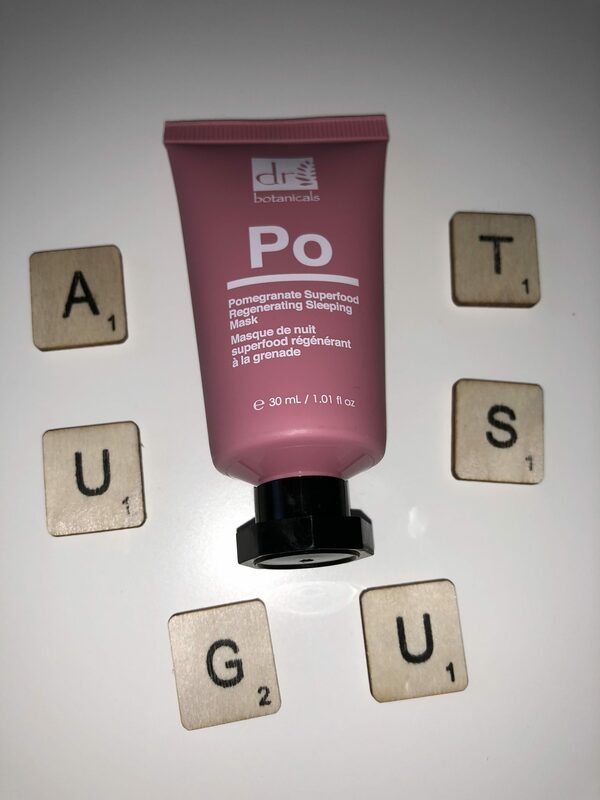 The first being the Dr Botanicals Po sleeping mask. It works so well with my skin. Really easy to use, cleanse and put on at night and take off in the morning. I use it 2-3 times a week and I can already feel a difference in my skin. Its so soft and smooth. The second item I love out of my Birchbox is the Rituals Shower Gel In sweet orange and sedarwood. I am not normally a fan of orange but its not overpowering. As soon as you put a bit on your body it foams up and is really nice to use. 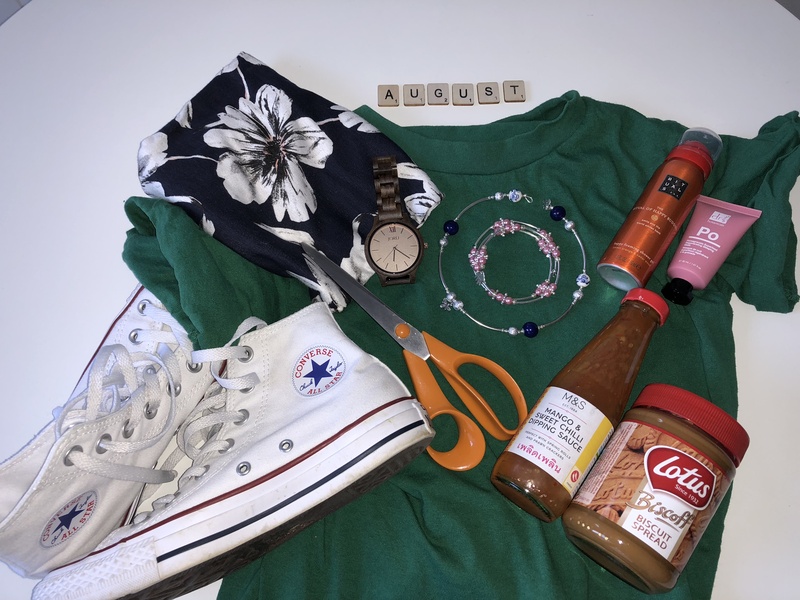 Moving on to fashion I have 3 things I have been loving this month. Comfort is key for me at the minute. I am so lucky that I can wear anything to work so I am wearing comfy clothes mainly. The first I have picked is these Topshop plain t-shirts with the rolled sleeves. I have these in 7 colours and so I could wear one a day if I wanted to. They are only £10 and so comfy, I pair them normally with what I would call pyjama bottoms. So comfy yet stylish. The second I have picked is my Jord Watch. 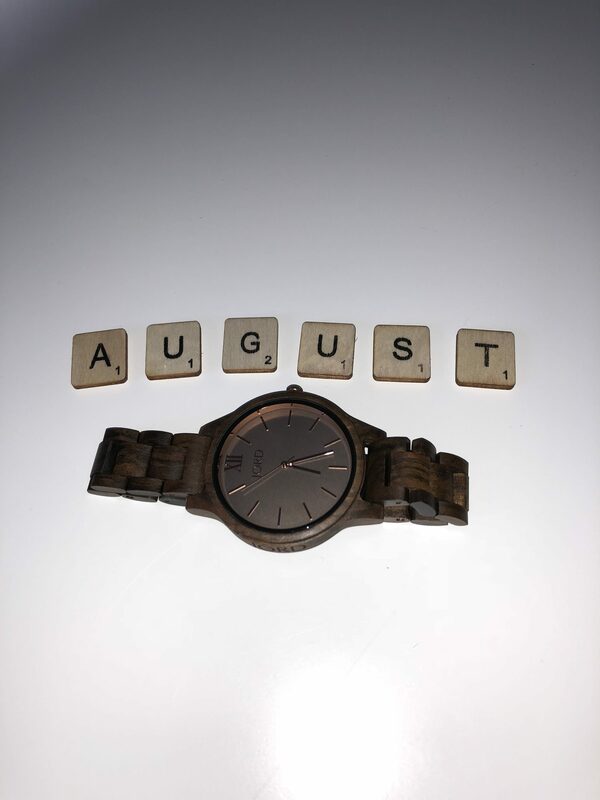 Now if you haven’t entered my giveaway you should, their watches are so comfy, they look trendy and fit so well. I have had several compliments from friends and family. As these are made from wood they are so unique. Its a watch you can dress up or down for any occasion. The last I have picked are my high top converse in white. Now the weather is slightly cooler I wear these a lot. They are so easy to chuck on and go. Comfy and keep your ankles warm. Converse are so handy to have because you can wear them with anything. They are also good to travel in, though taking them off through security is a pain. 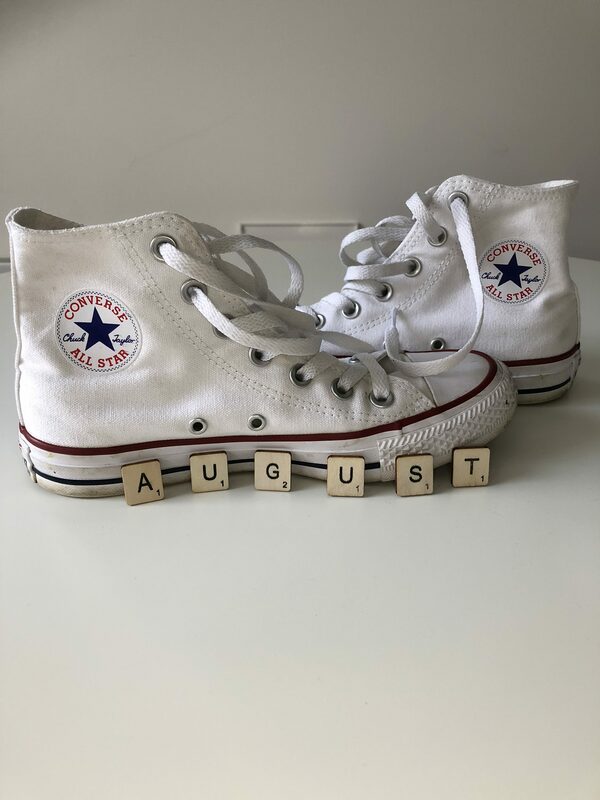 So there you have it my favourites for August. 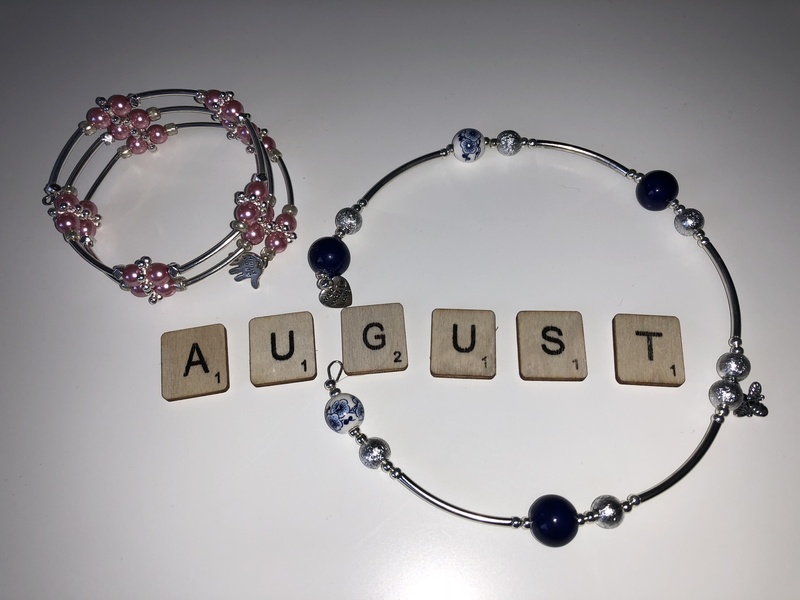 What have you been loving this month? Or out of mine what is your favourite? Love the rolled t-shirt look and you can’t go wrong with a pair of converse! This month I’ve fallen in love with Lush’s Ultrabland face wash- omg. That stuff is the BOMB at getting your make up off! Thank you. ooo I will have to try that. Love the choker and bracelet, so pretty! I have a tendency to get swept away in Pinterest for too long also looking at all sorts of crafty and DIY ideas. 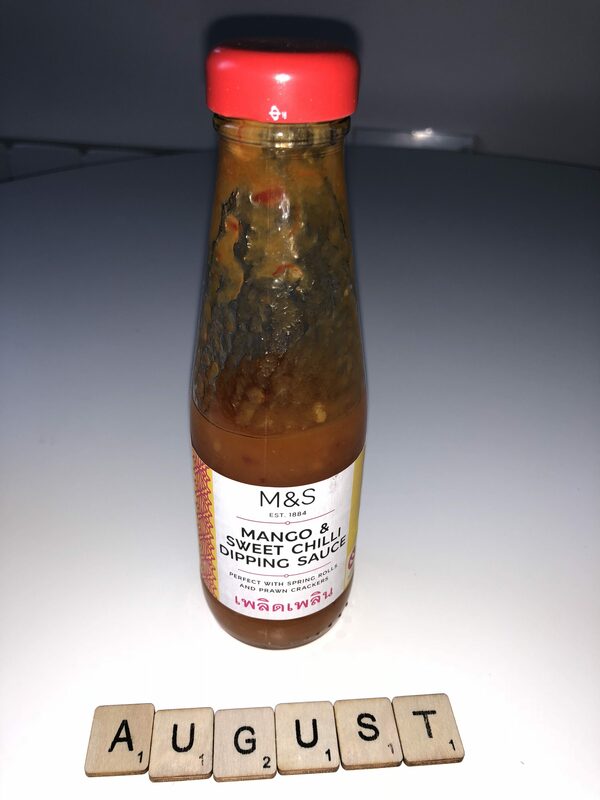 Soooo I’ll be off to M&S tonight for the Mango sweet chilli sauce!